State capitals can be hit or miss. Some, like Boston, are rightfully the centres of their states governments, being the largest city and most important economically and culturally. Others, like Albany, leave one head scratching, as they don’t seem to have much reason to exist outside of the perfunctory political duties, and are hardly worth a trip out of the way to visit. Then there are places like Austin that are neither the most economically important cities of their territories nor worthless political machines. With the combined influences of one of the country’s largest universities and one of the hemisphere’s best music scenes, Austin is a diamond in the rough, a Texan city unlike any other, and a slice of wonderful Americana. Being a university town can give even the most run down, barren ghost town a dynamic streak, or at least the possibility of a streaker late night. For Austin, it gives the city that legitimization of a youth orientation that sets it apart from any other city. There’s no other metropolis in the United States with such a high percentage of residents between 18-26, and the presence of University of Texas ensures this flow will steadily keep on coming. The youth scene has also led to a dynamic and varied bar scene, with famous 6th street the main drag. Some bars, like Jackrabbit, also purvey excellent food options like hearty burgers and New York style pizza. Speaking of burgers and pizza, Austin is a food Mecca with daring and adventurous culinary youth mixed in with old Americana classics. It’s a landscape dominated by heavy, hearty, food and large sides. Think Texas barbecue, chicken fried steak, chili, and Whataburger. Mix that in with exceptional Mexican (par for the course in Texas) and you get a salty, delicious and heart clogging combination of spice and sizzle that’s sure to leave you taste buds tingling. Have you seen food trucks begin to pop up here and there around your nearest big city? That might be due to a revolution spearheaded in Austin. They love meals on wheels in the Texas capital, and on South Congress Street is a trailer park filled with food trucks that make itinerant turns around the city when not stationed. Also on South Congress Street are several vintage shops and cowboy emporiums, meeting all your Southwestern needs. You can buy boots, hats, wranglers, and bolo ties in every size shape and color imaginable (provided those colors are red white and blue or burnt orange). 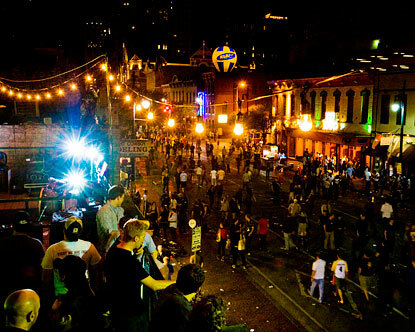 The special draw to Austin however is the unparalleled and peerless South by Southwest Festival that takes place every march for two weeks throughout the city. Abbreviated as SXSW, South by Southwest is a festival of technology, arts, music, dance and film that brings together the best up and comers in innovation and artistic exploration along with fans from all over the globe. The festival is one of a kind, a sort of festival without a particular venue that goes on for two weeks. It seeps out into the streets, and you can go without a ticket and are still guaranteed to have a good time. Austin is a dynamic and young city with plenty to justify a visit. It has a varied and delicious restaurant scene that fights above its weight, all the hustle and bustle of a large interdisciplinary University and loads of live music. It’s everything you’ve ever wanted to get from Texas without all the things you feared you’d get from Texas.